Kuurne-Brussel-Kuurne is known as the sprinter’s classic but today, it was a solo win for Jasper Stuyven, who took off about 16km from the finish and only looked back in the last few metres as he straightened his Trek-Segafredo jersey before his victory salute. The sprint finish was only for the other steps on the podium, won by race favourite Alexander Kristoff and Nacer Bouhanni. Jasper Stuyven was going to be my Rider of the Race well before he actually won with his crazy solo run into the finish. In great form and so strong in Omloop yesterday, if not for the overcooked corner, who knows what could have been? He shrugged off the disappointment and, with the help of teammate Boy van Poppel in the main break, Jasper put himself in an advantageous position at the front of the final Boonen break. As is the way with a lot of breakaways with strong riders, it all went a little scrappy-doo with glances all around to see who was going to use their energy to drag the others to the line. Stuyven was having none of the squabbling and went out on his own. “He’ll never make it” was almost certainly in the minds of, well, everyone, yet he held onto a 30sec advantage – and with a hefty tailwind as he went under the flamme rouge, he was in the arms of his soigneurs before the peloton made their also-ran sprint. Looks like Trek-Segafredo don’t need to worry about animating next year’s Classics after the retirement of Fabian Cancellara. Stuyven has an illustrious career ahead of him. Things that made us go ooooooh! 1 Sagan puts the hammer down on the Kwaremont. About 5min before Eurosport finished showing the all-important ski-jumping podium (! ), Sagan decided to give Sporza fans a thrill and his fellow riders a scare by putting the pedal to the medal and busting the peloton apart on the Kwaremont. It was so effective, the peloton was never as one for the rest of the race. Too far out to be a winning move, I suspect it was the Velvet Samurai’s gauntlet throw for Flanders. 2 Motos still a danger to the peloton. Today’s race saw a particularly nasty incident of moto v rider, with Lotto Soudal’s Stig Broeckx ending up in hospital after being hit – at speed – by the medical moto (who didn’t even stop to check if he was okay). He was taken to hospital, presumably by an ambulance. Wishing him a speedy recovery. 3 No returning champions this weekend. 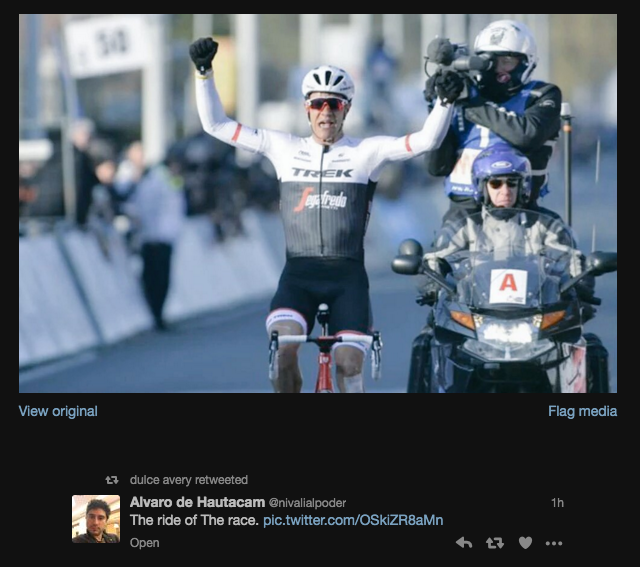 Neither Sky’s Ian Stannard nor Dimension Data’s Mark Cavendish opted to defend their Omloop/KBK titles this year. Stannard presumably to fry bigger fish in a few weeks, Cavendish presumably because Team Dimension Data weren’t in the race (although I’m fairly sure if he wanted to defend it, DD would have been invited). What an awesome winning move! Loving his aero solo break position on the Trek Madone with Balista helmet, very cool. Was a great weekend of Belgian racing.